Whether you have a steel or a wooden garage door, getting the right opener is crucial. The right opener can make your daily routine extremely convenient, while the wrong one, or one that doesn't fit as well as another one could have, will make things more difficult for you. That's why you should spend some time understanding what your needs are and checking out what is available in the market today. If you are going to invest in a new electric garage door opener, at least make sure you are getting one that is perfectly suited to your needs. This is the quietest opener type that you can get. Its drive system uses a steel-reinforced rubber belt that allows it to operate very quietly. If your bedroom is near or above your overhead door, a model of this type can be an excellent choice. Belt-drive openers tend to be more expensive, though, so if your budget is very limited, you may want to go with a different choice. Models of this type use a screw-like rod as their drive system. Their main advantage is that they require far less maintenance, due to the fact that there are fewer parts involved in their operation. They can be a little noisy, but not as much as their chain-based counterparts. As the name suggests, openers of this type use a steel chain to drive the door's movement. They are naturally quite noisy and chain adjustment will be required every once in a while. However, these models tend to be cheaper and stronger than a lot of the other options, so if you don't mind the noise and the added maintenance requirements, a chain-drive opener can be a great choice for your home. 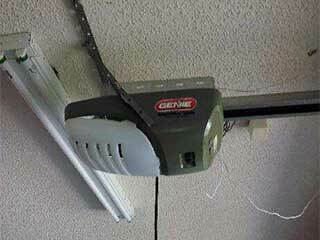 The most significant point when choosing a new garage door opener is your safety and security. A lot of brands have unique features that can ensure that. The Genie Intellicode and LiftMaster Security Plus are two examples of the application of rolling code technology, which will help your garage door opener keep your garage more secure. The weight of your door is another major consideration. Your opener must be able to generate enough horsepower to move it. Our team at Garage Door Repair Diamond Bar can consult you on all of this and offer an answer to any question you may have. Contact us today.